Note: As part of the citizen-to-citizen diplomacy group, consisting of 20 Americans and led by CCI’s Sharon Tennison, that traveled to Russia in June of this year, a discussion was conducted with Andrei Kortunov, Director General of the Russian International Affairs Council (RIAC) and President of the New Eurasia Foundation (FNE). Below, Sharon provides an introduction to the interview, which can be viewed at the link that follows. On June 2, 2015 we 20 American travelers split into groups of four and traveled by metros or taxis with student guides to different parts of Moscow. Our videographer Mel Van Dusen, Merlin Miller, organizer of a new political party from Tennessee, Charles Heberle, retired military who worked at the Pentagon and NATO and I went to see an old acquaintance with whom I’d kept up for over 30 years. Back in 1984 a group of us got an appointment to Moscow’s U.S.-Canada Institute, a quite prestigious ‘think tank’ that was considered the most liberal in the Soviet Union. To our surprise a quite young, blonde-haired young man introduced himself as Andrei Kortunov. He was decades younger than others in this prestigious institute. Obviously bright and comfortable in his position, he seemed warmly predisposed to all things American unlike others we had met. Andrei was interested in getting to discuss issues off and on with citizen diplomats from the U.S. During the Gorbachev and Yeltsin years I watched his career take him to positions of responsibility wherein he remained the same logical, open, helpful personality he exhibited from the beginning. Today Andrei is the Director General of the Russian International Affairs Council (RIAC) and the President of the New Eurasia Foundation (FNE). He is still as down to earth, modest and as hesitant-to-be-sharp as was the fair-haired young man we met at around age 20. One thing noted this time, he seems weary now from dealing with the heavy issues of his position—-yet is as always the consummate gentleman. Mel pushed him with questions that finally brought out his feelings on a number of issues related to the US-Russia relationship. Come along with us and meet Andrei. Opening scenes include the recently built pedestrian walkway over structures in downtown Moscow. We finally arrived at the new building that houses RIAC. Upon entering we passed through a gallery of magnificent paintings of 19th century Russian leaders. The environment was quite classical. Further into the building we navigated rooms of books, publications, researchers and on into Andrei’s office. This video segment was over an hour and was edited down to 13 minutes. We hope this brief clip gives you insight into the thinking of most Russians in Andrei’s age group today. He is now somewhere around 50 years old. Note: In June of this year, Sharon Tennison, founder of The Center for Citizen Initiatives (CCI), took a group of approximately 20 Americans on a citizen-to-citizen diplomacy tour of Russia. Sharon provides an introduction to the 13-minute video of the high points of the group’s tour from Moscow airport to Red Square. This first Youtube shows Moscow where we landed. It spans our first nine actual hours on ground, during which over two hours of video was shot––and the footage has been reduced to this 13-minute impression of Russia’s largest city. Mel Van Dusen, our pro bono videographer, was seeing Russia for the first time. He is the editor and voiceover for the series (with a little assistance from me). In addition he spent two months (pro bono) sifting through 60 hours of footage to provide a glimpse into today’s Russia. In the video Mel’s refers to our “bus” and our “guides,” but they aren’t official buses with guides. A Moscow friend of many years, Olga Gorbik, hired a private bus to get us and our luggage from the airport into the city. Olga is not a guide but did share knowledge of her home city on the way to the hotel. Upon arrival, another Russian friend of 30 years, Galina Nicolopolis (married a Greek years ago), met us and assisted me to get the group to simultaneous meetings across Moscow thereafter. She too has never been a guide but was a terrific helper. Then I knew of students who also assisted us while in Moscow. Our group traveled “off the grid” so to speak, with Russian friends and CCI alums helping us experience their cities and meet local people. There is no voice-over for Red Square so I will give you a few pointers. After landing and going through Moscow on metro, we are seen walking up toward Red Square where a “look alike” for President Putin tried to entice us to take a photo, then into the massive Square. In past decades, there were ominous parades of gigantic missiles, tanks, military forces and armaments of all types which we saw on American TV. When I first visited Red Square in 1983 it was formidable. There were narrow designated areas where we could walk, we needed permission to take a photo––the area seemed immense and somber. Times have changed! Paul McCartney and numerous rock groups have since held concerts in this very spot. Today it’s Moscow’s central square, clowns show up, elderly protesters wave signs and banners, bicyclists carefully maneuver the cobblestones. There were no policemen or security to be seen. I noted that there were very few foreigners compared to previous years––this footage shows ordinary Russian youth and parents milling around with their children. Entering the Square note on the left, the lovely Russian Orthodox Church, the Kazan Cathedral. Stalin ordered this church destroyed in 1936––a communist building was put in its place. In the 1990s shortly after the fall of communism, the Cathedral was precisely rebuilt using its original architectural plans and the same hues of a pale pinkish/orange and green. On the left still and next to Kazan Cathedral, is the huge GUM shopping center. In 1983 it was a massive run-down structure which sold women’s corsets, galoshes, sink stoppers, etc. Today GUM has captured high-end trade from over the world and sells costly fur coats, designer clothing, jewels and watches. Oligarchs and business magnates who come and go through the capital city stop here for their luxuries. Mel’s camera swings to the right to capture the thousand-year-old Kremlin Wall––the first walls and guard towers were built in 1156. With time, it has become this perfectly kept huge circular wall with numerous entrances, clocks and bell towers. Behind the red brick, one sees the yellow official buildings of the Russian government, the seat of power. 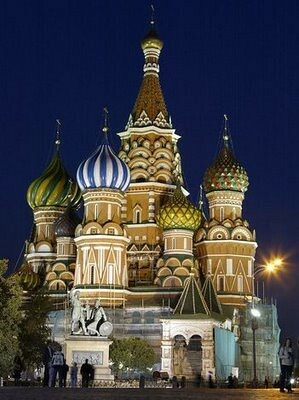 There are two major churches within the walls, the Assumption and the Annunciation Cathedrals. Fabulous art work can be seen therein. Next Mel catches St Basil’s Cathedral in the far end of Red Square, then moves to the right to Lenin’s Tomb ( some construction going on in front of it). This low, squat building was erected by Stalin and is quite different from the architecture of other buildings––and yes, Lenin’s body is still in residence. They keep debating what to do with it, but so far it remains. Then we see the majestic St. Basils up close showing the remarkable design and craftsmanship of this world famous church which holds services only once a year––but it stands daily as a reminder of the elegance of Russian artistry and the role of orthodoxy across Russia. Lastly, outside Red Square, a spacious white pavilion area has been recently built with eateries tucked away in various corners — we enjoyed a great dinner before catching the metro and getting back at our hotel to crash. Three decades ago, I could have never imagined that Moscow and Red Square would have transformed into this casual and fun environment. I wonder how many Americans know about the monument that was created by a renowned Russian sculptor, Zurab Tsereteli, and dedicated as a gift in 2006 by the Russian government in honor of the victims of 9/11. The mainstream western media does not seem to have provided much coverage of the event, if any at all. The artist, Zurab Tsereteli, was in his home in Moscow on the morning of September 11th. The television was on as he was getting ready for work and Zurab, like the rest of the world, was glued to coverage of the attacks on the Twin Towers. He watched the towers collapse on TV and was moved to tears. That day, he went to work at the Academy of Art driving on a route that takes him past the American Embassy. People were gathered outside the embassy gates to pay sympathies, to be together, and to mourn. 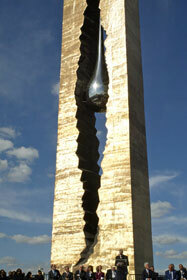 He saw a mass of crying people and decided to use the image of a tear in a memorial. He set to work that day on a proper and appropriate form through which to express his feelings over the attack. He went through many various sketches and ‘forms’ (all of which are chronicled in the yellow book) until finally deciding on the current monument’s form.